As the seasons start to change and we head in to fall, now is the perfect time to check out the wide variety of classes we offer for all fitness levels. We have everything from Spinning and Zumba, circuits, bootcamp, TRX, aqua aerobics, Yoga, Pilates and even Barre! 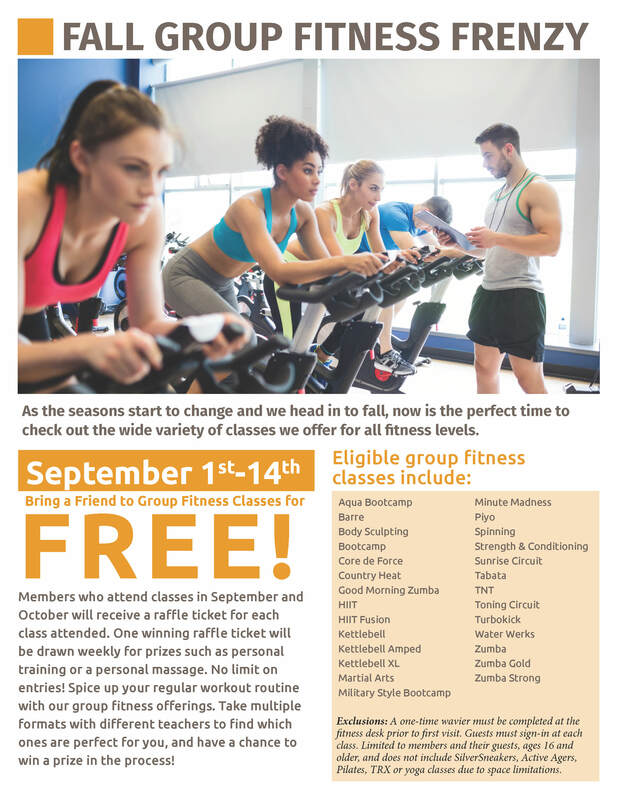 During Sept. 1-14, members are welcome to bring a friend for FREE to check out our group fitness offerings. Guests will be required to fill out a waiver prior to class. After the trial period has ended, guests are welcome to purchase a 10-class group fitness pass for $80. Passes expire one year after purchase. Exclusions: Limited to members 16 and older and does not include SilverSneakers/Active Agers/Pilates or Yoga Classes due to space limitations. Also, members who attend classes in September and October will receive a raffle ticket for each class attended. One winning raffle ticket will be drawn weekly for prizes such as personal training or a personal massage. No limit on entries! Spice up your regular workout routine with our group fitness offerings. Take multiple formats with different teachers to find which ones are perfect for you, and have a chance to win a prize in the process!